Herb Herbst may have retired from his longtime job but he has certainly never retired from helping improve his community and now everyone can spend an evening with the well-known and ever-engaging Ocean Grove resident Sat., Nov. 16. “An Evening with Herb” will be held at 7:30 p.m. at the Jersey Shore Arts Center- an institution that would never have existed without Herbst. “The secrets and history to restoring the arts center shall be revealed and they are both dramatic and humorous,” he said about his upcoming performance. During “An Evening with Herb,” this man on a mission who at 87 shows no signs of slowing down, will tell stories of his 17 years working to preserve the former Neptune High School, at the intersection of Main Avenue and Main Street (Route 71) and transform it into the Jersey Shore Arts Center. 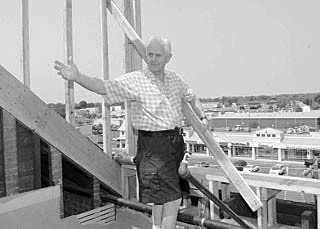 Herb Herbst atop the Arts Center. The evening also includes dance and vocal performances by the arts center’s own Shoreline Dance Academy and Rainbow’s End Studio. “And how can you go wrong when in the lobby will be the finest Italian food and other refreshments and desserts,” Herbst said. The evening’s proceeds will help fund restoration work to the building’s third floor, including creating the Culinary Center for the Visually Impaired and Special Needs Individuals. “If things go right, the culinary center should be in by February,” he said. 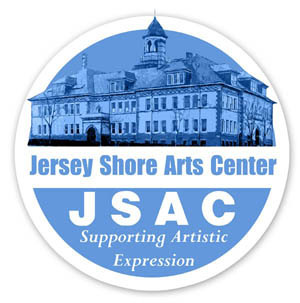 Admission is $20 and tickets can be purchased by telephoning 732-502-0050 or going to www.JerseyShoreArtsCenter.org. Tickets will also be available at the door. A gift auction and 50/50 raffle will also be offered. “It’s an excellent and worthy cause and an historic building is being saved. Saving the building from the wrecking ball has stories that offer both laughter and tears,” he said. Herbst retired from an executive position with New York Telephone in 1986. In 1997 he helped create the Ocean Grove Historic Preservation Society, Inc., a non-profit organization that owns and operates the arts center, which was formerly the old Neptune High School. Herbst’s grandson Brendan Kelley, 28, helps his grandfather operate and restore the arts center. “It has been a wonderful experience to work with him and build the arts center. My grandfather is a guy who is full of the energy of life. I have not had a boring day since I started working here and much of that is because of my grandfather. Anyone who has ever met him knows that there is never a dull moment with Herb,” he said. JSAC logo. Pictured at top is the interior at Christmas. The JSAC mission is to ensure that the arts flourish within the community by providing a venue for education and artistic expression as well as opportunities for participation in theater, music, art, dance, and activities for all ages. Built in 1896 the building was celebrated at the 1906 World’s Fair as an “Architectural Splendor.” But it had been closed after the new high school was built. During the 1980s the vacant building deteriorated. In 1997, the Ocean Grove Historic Preservation Society, led by Herbst, stepped in, purchased the building from the Board of Education and began to not only save the badly-damaged building but to realize Herbst’s dream by turning it into a home for cultural arts at the Jersey Shore. “There were fallen ceilings, ruined floors and walls, and there was a need to upgrade virtually every aspect of the building- from plumbing and electrical to sprinkler systems,” Herbst said. The first phase, completed in 2000, saw the opening of the first floor with five newly-renovated classrooms, restrooms, lobby, office space, and a magnificent 400-seat theater. Subsequent phases saw the construction of dressing rooms, costume and workshop rooms, and kitchen area in the lower level of the building Since then, the entire second floor has also been restored and renovated, including classrooms, the theater’s balcony with a seating area of 200, two dance studios and a third ballroom studio. “Since 2008 we have been restoring the third floor. The facilities will consist of a kitchen, preparation room, restrooms, classrooms and a service training area. To complete the third floor will require considerable financial support, and the Historical Society is embarking on a fundraising program to help facilitate the completion of this portion of the building,” Herbst said. Posted in Shore Communities and tagged Don Stine, Neptune, Ocean Grove.